The 74th Golden Globe Awards will take place tomorrow at the Beverly Hilton Hotel,. Limousines will discharge actors, directors and presenters at head of the red carpet. On their way to the ballroom past television crews and cheering fans they will also pose for 60 stills photographers, representing magazines, newspapers and photo agencies from all over the world -and one diminutive girl, shooting away with the best of them.That will be Juanita Hernandez, a bubbly and cheerful kid, representing a very different organization: The Pablove Foundation, a non-profit that helps children with cancer who are working hard to lead as normal a life as possible.One way to keep them engaged, creative and productive is through photography. Pablove provides photo equipment and instruction. The HFPA,which has given more than $ 23 million so far to various entertainment oriented charities and institutions counts the Pablove Foundation among its grantees for six years now. Juanita is a graduate of last year's photography summer camp. She is a third grader, who lives with her younger sister and Colombian-born parents inLos Angeles’ historic Boyle Heights neighborhood. She was diagnosed with cancer at age five, and had one of her kidneys removed. The operation was successful, Juanita is now in remission, and her doctors are optimistic, says Amanda, her mother. The family learned about the Pablove Foundation when Juanita was undergoing treatment, and it made a change in their lives, as it has done for hundreds of other kids with cancer, the Pablove Shutterbugs. Volunteer instructors are paired with the Shutterbugs, and teach them one on one, at home or in the hospital if needed, and also at a week long photo workshop held in the summer. It is an enriching experience for the adult mentors too. "Visiting a child with a serious illness in a hospital was at first terrifying" said one volunteer. "Their energy level is unpredictable. They might shoot three photos or 80. They may be sensitive to light and can only shoot indoors or in the dark. But they don't give up. And that courage has rubbed off on me." The HFPA does more than just award a grant. The Association also invites a Shutterbug to photograph at HFPA events such as the annual Golden Globe Awards. And this Sunday it will be Juanita. She has never photographed a celebrity before. (Her favorite photo- subject so far, she said, is her dog). On top of her list, she said, are Leonardo di Caprio, Colombian actress Sofia Vergara, and Emma Stone. When told that Stone will be walking the red carpet, as a nominee ( for Best Actress, Comedy or Musical Motion Picture) for her starring role in La La Land) Juanita's face shone with delight. So please, Ms. Stone, when you walk the red carpet and pose for the still photographers, look out for Juanita. She will be behind the Pablove sign, and at all of 4' 2", standing tallest. 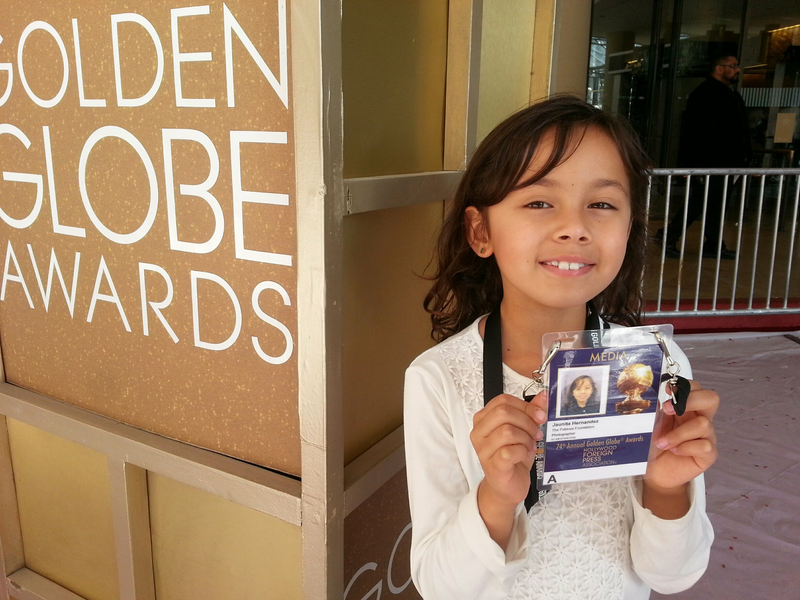 Welcome To The 74th Golden Globe Awards!